What Are Bone Fracture Symptoms and Signs? What Are Common Types of Bone Fractures? What Are Symptoms of Broken Wrist? What Are Hip Fracture Symptoms and Treatment? What Are Broken Leg Symptoms and Treatment? What Are Broken Shoulder Symptoms and Treatment? What Are Broken Hand or Fingers Symptoms and Treatment? What Are Open Fractures Symptoms and Treatment? What Are Stress Fracture Symptoms and Treatment? What Are Compression Fracture Symptoms and Treatment? What Are Broken Rib Symptoms and Treatment? What Are Skull Fracture Symptoms and Treatment? What Is Bone Fracture in Children? What Are Bone Fracture Treatments? Bone fracture, broken bone, and bone crack all mean the same thing. The bone has been damaged such that it is no longer intact. None of these terms indicate the severity of the bone damage. Bones are the body's storage place for calcium. Under hormone control, calcium content of bone is constantly increasing or decreasing. Bones break when they cannot withstand a force or trauma applied to them. Sometimes the bones are so weak that they cannot withstand the force of gravity, such as compression fractures of the back in the elderly. Fracture descriptions help explain how the breakage appears. For example, these descriptions may tell whether or not the fragments are aligned (displaced fracture) and whether or not the skin overlying the injury is damaged (compound fracture). Fractures may be complicated by damage to nearby blood vessels, nerves and muscles and joints. Fractures in children may be more difficult to diagnose because their bones lack enough calcium to be seen well on X-ray, and because injuries to growth plates (epiphyses) in the bones may not clearly show the fracture. Diagnosis of a fracture includes a history and physical examination. X-rays are often taken. Occasionally, CT or MRI scans are ordered to find an occult or hidden fracture, or provide more information regarding the damage to the bone and adjacent tissues. Fractures of the skull, spine and ribs have their own unique diagnosis and treatment complications. Bones form the skeleton of the body and allow the body to be supported against gravity to move and function in the world. Bones also protect some body parts, and bone marrow is the production center for blood products. Bone is a dynamic organ. It is the body's reservoir of calcium and is always undergoing change under the influence of hormones. Parathyroid hormone increases blood calcium levels by leeching calcium from bone, while calcitonin has the opposite effect, allowing bone to accept calcium from the blood. When outside forces such as a direct blows or falls are applied to bone it has the potential to fail. 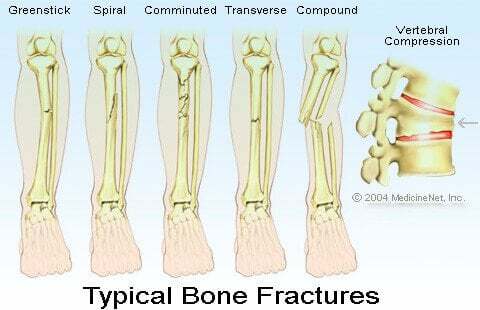 Fractures occur when bone cannot withstand those outside forces. Fracture, break, or crack all mean the same thing. One term does not imply a more or less severe injury. The integrity of the bone has been damaged, causing the bone structure to fail, which results in a fracture or broken bone. The nerve endings that surround bones contain pain fiber. These fibers may become irritated when the bone is broken or bruised. Broken bones bleed, and the blood and associated swelling (edema) causes pain. Muscles that surround the injured area may go into spasm when they try to hold the broken bone fragments in place, and these spasms may cause further pain. Often a fracture is easy to detect because there is obvious deformity. However, at times it is not easily diagnosed. It is important for the physician to take a history of the injury to decide what potential problems might exist. Moreover, there may be associated injuries that need to be addressed. Fractures can occur because of direct blows, twisting injuries, or falls. The type of forces or trauma applied to the bone determine what type of injury that occurs. Some fractures occur without any obvious trauma due to osteoporosis, defined as the loss of bone mass or a congenital bone cyst that has been present since birth, which causes a weak area in the bone. The first step in describing a fracture is to decide if it is open or closed. The skin protects the inside of the body, including bones, from the outside world. If the skin over the break is disrupted, then an open fracture exists. The skin can be cut, torn, or abraded (scraped), but if the skin's integrity is damaged, the potential for an infection of the bone exists. Because the fracture site in the bone is exposed to the outside world, these injuries often need to be cleaned out aggressively and often require anesthesia in the operating room to do the job effectively. Compound fracture was another term used to describe an open fracture. Next, there needs to be a description of the fracture line. Does the fracture line go across the bone (transverse), at an angle (oblique) or does it spiral? Is the fracture in two pieces or is it comminuted, in multiple pieces? A greenstick fracture describes the situation when the bone partially breaks. This often occurs in infants and children where the bone hasn't completely calcified and has the potential to bend instead of breaking completely through. It is similar to trying to break off a young branch or shoot from a tree (a green stick). Other fracture terms include torus or buckle fracture, again when only part of a bone breaks, which may occur in adults as well. Finally, the fracture's alignment is described as to whether the fracture fragments are displaced or in their normal anatomic position. If the bones fragments aren't in the right place, they need to be reduced or "set" and placed back into normal alignment. When bones break, they cause pain, swelling, and inflammation. The ability to move the joint above or below an injury does not guarantee that the bone is not broken. Instead, it means that the muscles and tendons that move the joint still work. Unless there is a previous underlying condition that prevents the patient from feeling pain (such as a spinal cord injury or diabetic neuropathy) all broken bones hurt. The pain may or may not be felt at the site of the break but can be referred elsewhere. For example, hip injuries, especially in children, can have knee pain. Other structures can be damaged when a bone breaks. Numbness and tingling can result if there is nerve inflammation or injury. A limb may be cool and without pulse, if the artery at the fracture site is torn, kinked or clots off, preventing blood from circulating. Wrist fractures are the most common fracture of people under the age of 75. Common causes of wrist fractures include falling on an outstretched hand causing one or more of the bones that make up the wrist to buckle. In this situation, a Colles' fracture, is often the result. In a Colles' fracture, a broken distal radius bone is displaced. Displaced fractures need to be aligned and kept in position while they heal so that the end result is not only cosmetically normal but also functionally normal. This is especially true if the fracture enters a joint. The joint surface needs to align perfectly, otherwise, over time, arthritis may develop limiting function and causing pain. Hip fractures are the most common fracture of people over the age of 75. Causes of a broken hip vary from falls or osteoporosis. Not all hip fractures are the same and the specific treatment, while almost always surgical, depends upon where the femur bone is broken. Common locations include subcapital, femoral neck, intertrochanteric and subtrochanteric. Each of these terms describes a location in the femur (thigh bone) where a break can commonly occur. Lower extremity fractures may involve the femur (thigh bone), the knee, the tibia and/or fibula, the ankle and the bones of the foot. Each has their own relatively common symptoms, signs, and treatment plan. The severity depends upon the location of the fracture, whether the bones are in alignment or displaced, and if the type of fracture is unstable. Some leg fractures are unstable and require surgery, while others are relatively stable and can be observed. Shoulder fractures are often treated without surgery. Fractures of the humerus, elbow, forearm, and wrist have different treatment plans compared to similar bones in the leg because they are not weight-bearing bones. Hands and fingers often are involved in crush injuries. In addition to the bone injury, the focus of the hand exam is on the tendons, arteries and nerves, again looking at the function in addition to anatomy. Bones in the hands and finger need to align properly to make certain that the power, range of motion and sensation are maintained optimally. Open fractures (compound fractures) are injuries where the skin over the broken bone is compromised, either cut or scraped. This allows the potential for infection to invade the bone causing osteomyelitis (bone infection). Depending upon the bone involved, the type of injury, and how much contamination is in and around the wound. The patient may require surgery to clean the wound area. Surgical realignment of the bone may be postponed once the risk of infection has decreased. Diagnosis usually is made by history and physical exam. Bone scan, CT scan, or MRI may be ordered to confirm the diagnosis. Treatment is conservative (no surgery is required). Rest, decreased weight bearing, ice, and anti-inflammatory medication such as ibuprofen (Advil) often are all the treatment required. These fractures can take six to eight weeks to heal. Trying to return too quickly may cause re-injury, and may also allow the stress fracture to extend through the entire bone and displace, which may turn a stress fracture into a "real" fracture that requires casting or surgery. Surgery is not commonly performed for routine stress fractures. Shin splints may have very similar symptoms as a stress fracture of the tibia but they are due to inflammation of the covering of the bone, called the periosteum. Shin splints are caused by overuse, especially in runners, walkers, dancers, including those who do aerobics. Muscles that run through the periosteum and the bone itself may also become inflamed. Treatment is similar to a stress fracture, and physical therapy can be helpful. As people age, there is a potential for the bones to develop osteoporosis, a condition where bones lose their calcium content. This makes bone more susceptible to breaking. One such type of injury is a compression fracture to the spine, most often the thoracic or lumbar spine. Since we are an upright animal, if the bones of the back cannot withstand the force of gravity these bones can crumple. Pain is the major complaint, especially with movement and often there is an acute event where the pain is felt. There may or not be a fall or injury associated with the pain as compression fractures may occur spontaneously. Compression injuries of the back may or may not be associated with nerve or spinal cord injury. An X-ray of the back can reveal the bone injury, however, sometimes a CT scan or MRI will be used to ensure that no damage is done to the spinal cord. However, if there is a loss of bowel control or the inability to urinate (urinary retention), the symptoms of cauda equina syndrome, requires an emergent MRI to assure that the spinal cord is not at risk of permanent damage. Treatment includes pain medication and often a back brace. Some compression fractures can also be treated with vertebroplasty. Vertebroplasty involves inserting a glue-like material into the center of the collapsed spinal vertebra in order to stabilize and strengthen the crushed bone. The glue (methyl methacrylate) is inserted with a needle and syringe through the anesthetized skin into the midportion of the vertebra under the guidance of specialized X-ray equipment. Once inserted, the glue soon hardens, forming a cast-like structure within the compressed vertebra. However, there are studies and controversy whether this procedure is effective and beneficial. The ribs are especially vulnerable to injury and are prone to breaking due to a direct blow. Rib X-rays are rarely taken since it doesn't matter if the rib is broken or just bruised. A chest X-ray often ordered to make certain there is no collapse or bruising of the lung. As we breathe, our ribs and lungs expand like a bellows. When we breathe, the ribs swing out and the diaphragm, the muscle that separates the chest wall and abdomen pushes down and the air is sucked into the lungs. When a person has a rib injury, the pain associated with that injury, be it a fracture or contusion (bruise), makes breathing difficult and the person has a tendency to not take deep breaths. If the lung underlying the injury does not expand, it is at risk for infection. The person is then susceptible to pneumonia (lung infection), which is characterized by fever, cough, and shortness of breath. As opposed to other parts of the body that can rest when they are injured, it is very important to take deep breaths to prevent pneumonia when rib fractures are present. The treatment for bruised and broken ribs is the same: ice to the chest wall, ibuprofen as an anti-inflammatory, deep breaths, and pain medication. Even if all goes well, there will be significant pain for four to six weeks. Ribs are no longer wrapped because this prevents the victim from breathing deeply, which may lead to the complication of pneumonia. With lower rib fractures, there may be concern about organs in the abdomen that the ribs protect. The liver is located under the ribs on the right side of the chest, and the spleen under the ribs on the left side of the chest. Many times your doctor may be more worried about the abdominal injury than about the broken rib itself. Ultrasound or CT scan may help diagnosis intra-abdominal injuries. With the wide availability of CT scans, skull X-rays are rarely taken to diagnose head injury. If a head injury exists, the doctor will feel or palpate the scalp and skull to determine if there may be a skull fracture present. A nervous system exam may be done assessing brain function. Fractures of the base of the skull may cause hemotympanum (blood behind the eardrum), Battle's sign (bruising behind the ear), or raccoon eyes (bruising around the eye sockets). The skull is a flat, compact bone and it takes significant force to break it. If a skull fracture exists, there is an increased likelihood of bleeding in the brain, especially in children. There are guidelines that are available to decide whether a CT scan is indicated (needed). Some bone is more likely to break because of underlying disease such as cancer. Pathologic fractures are breaks in a bone that has been invaded by tumor and has become weaker and unable to withstand normal activity. There may be no specific injury that causes the fracture. Some patients have bone cysts that have been present a lifetime and are only discovered when an X-ray is taken for another reason like an injury. Children can break bones and yet have normal X-rays. Fractures appear as clear lines through the bone on an X-ray through the bone. If calcium hasn't yet accumulated in the repairing bone, the break may not be apparent. This lack of calcification happens in two ways. Bones mature at different times in a child's development and while the bony structure is there, it may have more cartilage than calcium. The second situation is associated with growth plates. Each bone has an area where cell activity is maximal and where the bone grows. These areas appear as lucent (clear) lines on X-ray. It is one of the weaker points in the bone as well. A fracture through the growth plate may not be seen on X-ray. The doctor needs to match the history and physical exam with what is seen on X-ray to make to a diagnosis. Sometimes, the child is placed in a cast for a period of time to protect the broken limb. As fractures heal, the body lays down extra calcium as building material and then remodels it to normal shape. After 7-10 days, there may be evidence on X-ray of the healing calcium to confirm the fracture. Growth plate fractures are classified by the Salter-Harris category. This classification describes the extent of the damage to the growth plate. when a break occurs through the growth plate, it can involve different parts of the bone on each side of the plate. It is important that these fractures are aligned properly so that the bone grows properly as the child ages. Children are more flexible than adults until the calcium completely solidifies their bone. If you think of an arm or leg bone as tubular, sometimes only one side of the bone breaks, just like an immature branch on a tree. This is referred to as a greenstick fracture and may need to be "set" (reduced) so that it heals properly. Sometimes the bones can bend but not break because they are so pliable. This is called a plastic deformity or bow fracture and will need to be set or aligned to allow proper healing. The story of the injury is often key to proper diagnosis. Where, when, and why did the injury occur? Did the person trip and fall, or did they pass out before the fall? Are there other injuries that take precedence over the fracture? For example, a person who falls and hurts their wrist because they had a stroke or heart attack will have their fracture care delayed to allow care for the life-threatening illness. Multiple trauma victims may have their orthopedic surgery delayed to address bleeding in the brain, chest or abdomen. Physical exam follows the history of the injury. The injured area will be examined and a search will happen for potential associated injuries. These include damage to skin, arteries, and nerves. Pain control is a priority and many times, pain medication will be prescribed before the diagnosis is made. If the healthcare professional believes that an operation is potentially required, pain medication will be given through an intravenous (IV) line or by an injection into the muscle. This allows the stomach to remain empty for anesthesia. A decision will be made whether X-rays are required, and which type of X-ray should be taken to make the diagnosis and better assess the injury. There are guidelines in place to help healthcare professionals decide if an X-ray is necessary. Some include the Ottawa ankle and knee X-ray rules. These rules were developed to minimize the number of X-rays taken and decrease the radiation in which a patient is exposed. The body is three dimensional, and plain film X-rays are only two dimensional. Therefore, two or three X-rays of the injured areas may be taken in different positions and planes to give a true picture of the injury. Sometimes the fracture will not be seen in one position but is easily seen in another. There are areas of the body where one bone fracture is associated with another fracture at a more distant part. For example, the bones of the forearm make a circle and it is difficult to break just one bone in that circle. Think of trying to break a pretzel in just one place, it is difficult to do. Therefore broken bones at the wrist may be associated with an elbow injury. Similarly, an ankle injury can be accompanied by a knee fracture. The health care professional may X-ray areas of the body that don't initially appear to be injured. Occasionally, the broken bone isn't easily seen, but there may be other signs that a fracture exists. In elbow injuries, fluid seen in the joint on X-ray (sail sign) is often an indicator of a subtle fracture. Wrist injuries with fractures of the scaphoid or navicular bones may not show up on X-ray for one to two weeks, and diagnosis is made solely on physical examination with swelling and tenderness over the snuffbox at the base of the thumb. In children, bones may have numerous growth plates that can cause confusion when reading an X-ray. Sometimes, the healthcare professional will X-ray the opposite arm, leg or joint for comparison to determine what normal is for that child before deciding whether a fracture exists. In the field, the initial treatment for fractures of the arms, legs, hands, and feet include splinting the extremity in the position it is found, elevation and ice. Immobilization will be very helpful with initial pain control. For injuries of the neck and back, many times, first responders or paramedics may choose to place the injured person on a long board and in a neck collar to protect the spinal cord from potential injury. Once the fracture has been diagnosed, the initial treatment for most limb fractures is a splint. Padded pieces of plaster or fiberglass are placed over the injured limb and wrapped with gauze and an elastic wrap to immobilize the break. The joints above and below the injury are immobilized to prevent movement at the fracture site. This initial splint does not go completely around the limb. After a few days, the splint is removed and replaced by a circumferential cast. Circumferential casting usually does not occur initially because fractures swell (edema). This swelling could cause a build-up of pressure under the cast, yielding increased pain and the potential for damage to the tissues under the cast. However, if the fracture required reduction (putting the bones back into alignment) there might be a need for the circumferential cast to keep the bones in place. Surgery on fractures is very much dependent on what bone is broken, where it is broken, and whether the orthopedic surgeon believes that the break is at risk for moving out of place once the bone fragments have been aligned. If the surgeon is concerned that the bones will heal improperly, an operation will be needed. Sometimes bones that appear to be aligned normally are splinted, and at a recheck appointment, are found to be unstable and require surgery at a later date. Surgery can include closed reduction and casting, where under anesthesia, the bones are manipulated so that alignment is restored and a cast is placed to hold the bones in that alignment. Sometimes, the bones are broken in such a way that they need to have metal hardware inserted to hold them in place. Open reduction means that, in the operating room, the skin is cut open and pins, plates, or rods are inserted into the bone to hold it in place until healing occurs. Depending on the fracture, some of these pieces of metal are permanent (never removed), and some are temporary until the healing of the bone is complete and surgically removed at a later time. Robinson, Y. et al. Vertebroplasty and kyphoplasty--a systematic review of cement augmentation techniques for osteoporotic vertebral compression fractures compared to standard medical therapy. Maturitas. 2012 May;72(1):42-9. doi: 10.1016/j.maturitas.2012.02.010. Epub 2012 Mar 16. Please share your experience with broken bone(s). What caused your broken bone(s)? What treatments were administered for your fractures? What were the symptoms and signs of your fracture(s)?